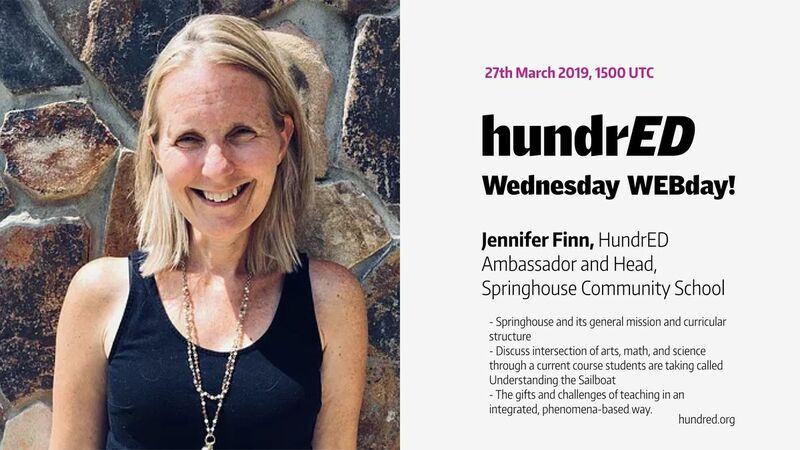 Join Jennifer Finn, Head of School at Springhouse Community School and a HundrED Ambassador from the US as she goes live with some of her students exploring questions like "Why do we silo subjects like math, science, and art when life itself is whole and integrated? What can we learn by focusing on a phenomenon, such as building a sailboat, using different lenses?" Join the conversation on Wednesday, March 27, 2019, at 15:00 (UTC). Jenny Finn is a co-founder and the Head of School of Springhouse Community School. She holds a Ph.D. in Sustainability Education from Prescott College and a master’s degree in Social Work from Colorado State University. Jenny is one of the co-founders of Springhouse Community School and is deeply committed to serving the vision and mission of the school. She understands that relationship to the world around us begins with the connection we have to ourselves, and Jenny's work, in all its forms, fosters this deeper connection. To live in relationship with ourselves and with the world, it is essential that we learn how to traverse the landscape within. In a culture that often fosters separation and disconnection, Jenny’s research, mentoring, and teaching foster greater intimacy with all of life by exploring creative and courageous ways to face discomfort and navigate vulnerability. She has worked in the healing arts field for over twenty years serving in various areas including non-profit management, trauma and hospice care, spiritual care and chaplaincy, clinical private practice, and education. She is honored to serve the important mission of reimagining education in ways that foster wholeness and connection at Springhouse Community School. Chris Wolf is the Dean of Students at Springhouse. Chris grew up in southeastern Pennsylvania where he attended the Kimberton Waldorf School and developed a deep appreciation for the arts, the natural world, imagination, wonder, and learning itself. He spent summers taking part in Langskib wilderness programs in northern Ontario where he eventually led canoe trips in his late teens and early twenties, guiding adolescents through rites of passage. He earned a B.S. in Agricultural Economics from McGill University and has worked in many places that help food make it from ground to plate. He loves to sing and has been leading shape note singing in Floyd since 2015. Chris has been interested in education for a long time and has taught English as a foreign language in the Republic of Georgia and math at Springhouse. He developed the Ridgelines after-school program for teen boys and has worked with young adults in The Well program since 2017. HundrED WEBdays take place weekly via Facebook Live and we invite everyone to actively participate in the conversation! You can access the webinars by joining the HundrED Facebook page. Contact our Global Community Manager, Pukhraj Ranjan, for more information: pukhraj@hundred.org.